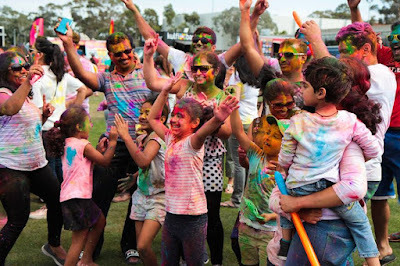 Monash University has once again celebrated a colour filled weekend with the third annual celebration of the 'Holi Festival of Colours (Rang Barse Holi Festival of Colours)' taking place on Sunday 11 March, 2018. The event attracted over 3500 participants to Monash Sport, Clayton. The event, a collaboration between Monash University, the City of Monash, and 'Sankat Mochan Samiti' celebrated peace, harmony and friendship amongst friends, family and strangers through a range of diverse music and vibrant colours. The festival is an ancient Hindu celebration that signifies the end of winter and the arrival of spring in India, and Melbourne didn't fail to put on amazing weather for the event. The aim of the festival was to bring communities and individuals together from all kinds of different cultural, religious and national identities and, now in its second year, the festival was once again a huge success with food trucks, carnival rides and live performances drawing in people from diverse backgrounds. Students and families from the Monash community all came together to take part in the vibrant celebration of love and colour by throwing coloured powder, supplied by the festival organisers. The vibrant colours being thrown around the festival brought everyone closer together and made the experience unique for everyone involved in attending and running the event. We want to give a massive thank you to everyone that was able to attend, and we hope you were able to enjoy the full Holi Festival experience. Monash University would also like to thank the City of Monash and 'Sankat Mochan Samiti' for assisting in the creation and running of the event. For more information on the Holi festival and to see photos from the event please click here.